Greetings, Musers. With the launch of the patreon account and the signing on of some of our members, we have reached our first goal: commitment to a weekly schedule of posts here on the blog. I’m excited (and slightly terrified) of the prospects of having a regular schedule and deadline to meet on a weekly basis. Hopefully, I’m up to the challenge. I’ve laid out a rough preliminary schedule for the topics for the foreseeable future. Week 1) General Hobby update: Thoughts on crews I'm working on, some pictures of painted models, etc. Week 2) Book Review: Review of a physical Malifaux product of some kind. Likely to be Through the Breach related, as their publishing schedule is more frequent. Week 3) Tactics Articles: Tournament reports, crew list theory, etc. Week 4) Story Article: A look at the fluff of the world of Malifaux. Could be some articles that, say, would break down one of the factions or masters through the development of the Malifaux story, or would include my efforts at writing some short fiction. I’ve also considered including “Musing on a Meme” articles, where I make a meme list that focuses on some oddity of the Malifaux game or fluff to make a unique crew that, perhaps, isn’t the most competitive thing out there. These posts would be in addition to material written by Phiasco, of course, so that’s even more content, all thanks to our Patreon Supporters! Speaking of which, our Patreon campaign is still going, and we’re still looking for more support. I don’t need to replace my income with Malifaux Musings or anything crazy, but it would sure make me feel better about taking time away from my family or job or free time (ha ha, like I have much of that) to write here when I know it’s going towards bringing in some cash for us. Plus, the money from it can go towards buying more Malifaux stuff to feed the blog. Enjoy the Through the Breach review last week? We can do more stuff like that in the future, even including some of the models, using the cash brought in through Patreon. I’m not asking for a ton of cash from you, either. Can you afford $1 a month? I’ll take it! With the new publication schedule, that’s literally .25 cents per post. I don’t even want to think how silly the word count payrate would be for that. If you want to give me more, I won’t stop you, but $! is all I ask. Let’s see what we can turn this thing into together. -ld. Um, excuse me. Hello, little man. I’m in the middle of a Malifaux Musings post at the moment. I’m going to talk about Titania. Can I help you? Well. Yes. I know. But it’s Autumn now. Thematically, I should be playing the Autumn Queen. And, you know how she gets when she feels like I’m not paying enough attention to her. Sigh. Alright. Let’s go play some Collodi. *ahem* Take two. It’s Autumn, and you know what that means, time to honor the Autumn Queen by playing her loyal servants, The Neverborn! This of course includes (presumably) the Puppet Master Collodi, the master you voted for me to build! My opponent was Phiasco trying out Parker Barrows (who, you’ll recall, won the poll. Phiasco agreed to pick him up and give him a whirl.) We were playing in Vassal and I randomly picked a map, which turned out to be one of the interior maps for which that platform is (in)famous. My goal was to play a minion-heavy crew with the Mysterious Emmisary and Collodi providing support, so I went with the Fated limited upgrade, lots of Effigies, a couple of Stitched, and some Marionettes. This was really a trial-run/dress rehearsal, since I had never used several of these models before. I learned a lot of lessons this game, though I don’t remember exactly what happened all the way through (for reasons that will become apparent shortly.) Rather than go through it turn by turn breaking down every (in)correct decision I was making, therefore, let me put up a visual aid and walk you through the lessons I learned from this game. 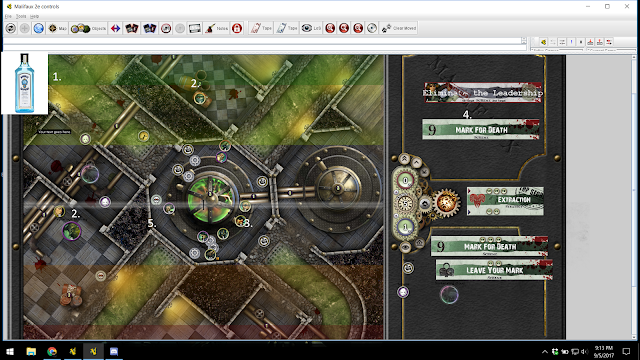 Lesson 1: Don’t Drink and Malifaux. Ok, I know that people like to have a drink or two while they’re playing. That’s fine. What I’m saying is don’t get hammered as the game goes along if you’re interested in actually winning. Refilling my double gin and tonic at the beginning of every turn seemed like a good idea early on. It didn’t play out that way by the finish. And it definitely didn’t seem like a good decision the next day (a Wednesday) when I had to get up at 6:15 to get my kids to school and go to work. Make good choices, folks. This is probably the most “drunk-faux” thing I did in the game, but for some reason I decided to send my Mysterious Emissary, who was carrying the generic conflux to feed all my puppets + flips, off by himself to go hunt down an enemy Wokou Raider. I know why I did it (to stop Phiasco from scoring Leave Your Mark) but the whole point of this crew was overlapping buffs and to summon Changelings to copy strong attacks from the other crewmembers (Stitched, Lucky Effigy). Neither of those things were happening with him all the way out on the flank like that. On the other flank, there’s my dumb Shadow Effigy, also out where he can’t help the fighting or score points. If I had taken Leave Your Mark, of course, he could have been scoring that. But like a dummy, I thought “Well I try that every game. Why don’t I mix things up?” You do them every game because they’re reliable points, stupid. Go with what works! I mean, I kind of knew this one already, but for this game I wanted to just throw some things up against the wall and see what stuck. It turned out that very few of the puppets were all that sticky. The Effigies don’t do a ton of damage, so sinking 20ish points into them is not a good move, as almost half your crew is basically just there to buff Collodi and the other little minions who are also kinda puny. I had thought Lucky was a good choice for the silly damage buff he receives, and he still might be since he got popped pretty early in this one, but it wasn’t enough. On the other hand, Stitched Together are real good. Most of the damage you see on Maddox and Hans came from the two Stitched I brought along. Again, this isn’t exactly a revelation, but it was good to see what they can really do. I seem to have some fairly horrendous Gamble Your Life luck when I’ve used them, and they mostly just seem to blow themselves up. If I had been trying to complete Leave Your Mark, the Shadow Effigy would have been a fine inclusion. But I wasn’t, so there was no reason for it to be there. I hear a lot of fanfare for the Arcane, and I can see where it would be useful, but it did nothing at all in this game. So, basically, I need to build crews where I include puppets because they have a specific job that they do well, not just because they say “puppet” on them. And, also, the ME was probably again not the best choice for this crew. Sigh. Someday, Mysterious Emissary. Someday. I thought that with all the activations in this crew I’d be in good shape for Marked for Death, and I thought that Parker wouldn’t be an especially tough model to at least knock down to half wounds. Neither of those things really turned out, mostly due to my opponent having me out-ranged. By the time I got close enough for melee most of my puppets had been shot to death. I needed to use Collodi and the Stitched’s Creepy Fog to better effect and shield their advance by disrupting the opponent. I was trying to keep Collodi back as a support piece, which meant that I couldn’t bring his strong attack actions to bear until turn 4, which was too late for them to make a difference. If I wanted to play a killy scheme pool, I needed to bring killy models. Illuminateds work well with C because he can toss out his focus and his effigy buffs to them, as Minions. Basically, pick a lane and stick to it. Don’t try to do all the things. The best I did in this happened after the puppet master got involved. He’s just so disruptive! Passing out slow or Obey type effects to the enemy or, worse, combining the two is so strong. That attack action is the reason you play this master. He can’t do that when he’s trailing along behind his puppets trying to play it safe and stay out of the fray. Now, obviously, if your opponent is playing Pandora or something you don’t want to be mixing it up with things that can attack your WP if you can help it, but still. Not getting him into the action was a big tactical mistake. I don’t know if it would have been enough to swing things, but it certainly would have made it closer. Summation: Learn to Play, Newb. So I ended up grabbing the last point for extraction and blocking it from Phiasco again. I could have possibly made this competitive on the last few turns if I could have either started marking and killing things or knocked out Parker, but there just wasn’t enough time to recover from the way the game started. I’m relatively pleased that I at least was able to take the strat points, but I had to deny schemes somewhere if I was going to get into this thing (surprise, Adam occasionally forgets to play defense. This is not a new occurrence.) I need to get some real hitters into this list and get some of the useless puppets out of there. I was not super blown-away with the Marionettes, either, but I think their best work comes when they’re able to take hits for Collodi, which didn’t become necessary here, or pass out points of Burning from the Arcane’s (0). I’m looking at my Illuminated, obviously, but I think Ronin could be interesting as well. I’ve heard good things about incorporating Lazarus into the crew, but I’m trying to stay with things I actually own for the time being. If/when that alternate Lazarus they teased ever comes out, maybe I’ll pick it up and he can join the puppet show. I’ll ask Phiasco to (if he has time) come in and add his thoughts on Parker at the end of this. I think our next games with these masters will be not facing off head to head (IE I play Collodi versus him with someone else, and then we play another game where he has Parker and I play someone else) to keep the diversity up. But, in any case, we had our first rehearsal. It was ugly, but you don’t get better without practice. The show must go on!